This recommended practice (RP) has the following purposes: 1.) define what core skills and knowledge of cost engineering a person is required to have in order to be considered a professional practitioner, and in doing so, 2.) establish the emphasis of core subjects for AACE International education and certification programs. It is also hoped that enterprises will find this useful as a reference or guide for developing their own competency models. Knowledge is an understanding gained through experience or study, and skills are abilities that transform knowledge into use. 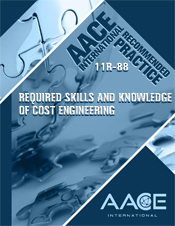 Core subjects are those whose usage is occasional to frequent and are considered by AACE International as being required for professional practitioners of cost engineering to know and be able to use. This recommended practice lists these core subjects and provides general performance statements (i.e., “be able to” describe, perform, etc.) to represent the level of proficiency expected in each subject area. These statements are representative or guiding examples only.